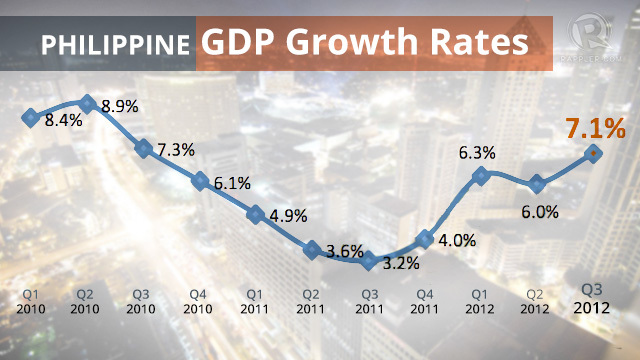 The economic growth of the Philippines is one of the best in Asia. Latest on economy updates: leading indicators points to economic growth for this year and the government eyes P2.268-trillion budget for next year. This is indeed good news for the improving economic climate of the Philippines. The National Statistical Coordination Board reported that the Philippines’ economic growth appears to be locked in for the first quarter as an index tracking 11 key indicators improved for the first time after a decline in 2012albeit remaining in negative territory. The leading economic indicator improved to -0.008 from -0.013 in the 4th quarter of 2012. The GDP of 2012 grew at 6.6%, exceeding the government’s target of 5-6% and for this year, the government is targeting 6-7% growth. 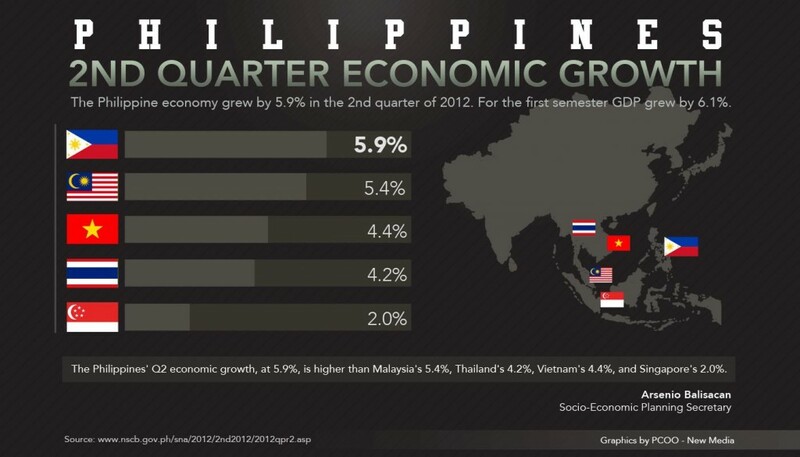 The 5 indicators, which contributed positive to LEI, went up by 52.9% from 15.4% in the previous quarter. Visitor arrivals topped the list with the new number of business, foreign exchange rate, the stock price index and the consumer price index following. The wholesale price index, total merchandise imports, electric energy consumption, hotel occupancy rate and money supply also reported declines, combining an overall 47.1%. “For the Q1 2013 LEI, three indicators shifted direction in contribution from the fourth quarter of 2012, namely: terms of trade index from positive to negative, and number of new businesses and visitor arrivals from negative to positive,” the NSCB said. “We expect growth to ease to 5.8% in 2013 from 6.6% in 2012, given domestic consumption remains resilient, as growth from within and steady remittance inflows insulate the domestic economy from external shocks. Imports growth could rebound after a subdued 2012, while the contribution of net exports to growth fade, there are a few positive upsides to growth as we watch out for the PPP program by the Philippine government to provide upside momentum to growth in 2013,” Mr. Jeff Ng, an Economist at Standard Chartered Bank in Hong Kong, said. The proposed 2014 ceiling is P262.1 billion more than this year’s budget, which assumed gross domestic product (GDP) growth of 6-7%. The agriculture sector expecting a 3.5-4.5 growth this year. 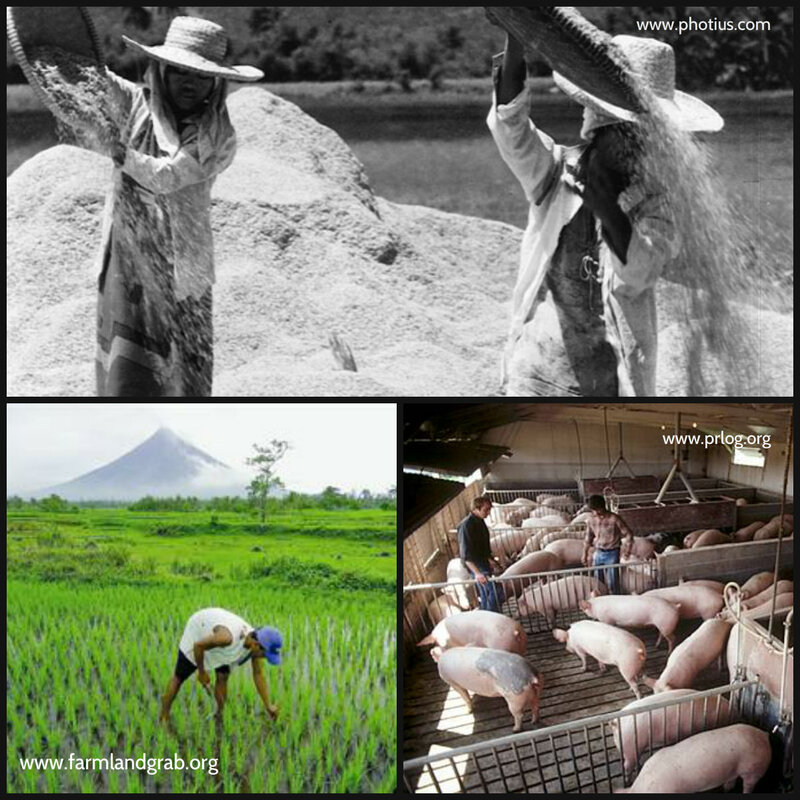 With the agriculture sector expecting a 3.5-4.5 growth this year, this could grow 3.3.-4.3% in 2014 with the budget. The growth for 2013 and 2014 is higher than the 2.92% growth in 2012. The medium-term growth will be fueled by the government’s food sufficiency program. The livestock and poultry expansions will be supported by the infrastructure support system, promotion of feed substitutes, and expansion of export opportunities. In other sectors, industry is expected to grow 7.4-8.6% in 2014, up from 6.6-7.6% outlook this year while the services sector is expected to expand by 6.5-7.4% in 2014, up from the 6.3-7.3% outlook for this year. It is expected to be driven mainly by transportation, tourism and the real estate sectors. Other assumptions detailed in the memorandum are gross national income growth of 5.8-6.8%, up from the 5.5-6.5% expected this year and last year’s actual rate of 5.8%; inflation staying within 3-5%; a 364-day Treasury bill rate of 2-4%; and a peso-dollar exchange rate of P42-45 per US dollar — all unchanged from this year. The budget memorandum notes that risks to inflation remain “broadly balanced” despite lingering concerns over the weak global economic environment. Interest rates and the peso, meanwhile, will be supported by the domestic economy’s resilience and will be influenced by developments in the government’s fiscal position and the central bank’s policy stance, as well as the expectation of a steady stream of capital inflows and remittances. On the fiscal side, the budget deficit is expected to settle at 2% of GDP this year and next year, in line with the government’s medium-term fiscal consolidation program. For government spending, it will rise to P2.291 trillion or 17.2% of GDP in 2014 higher from this year’s P1.984-trillion program or 16.7% of the economy. 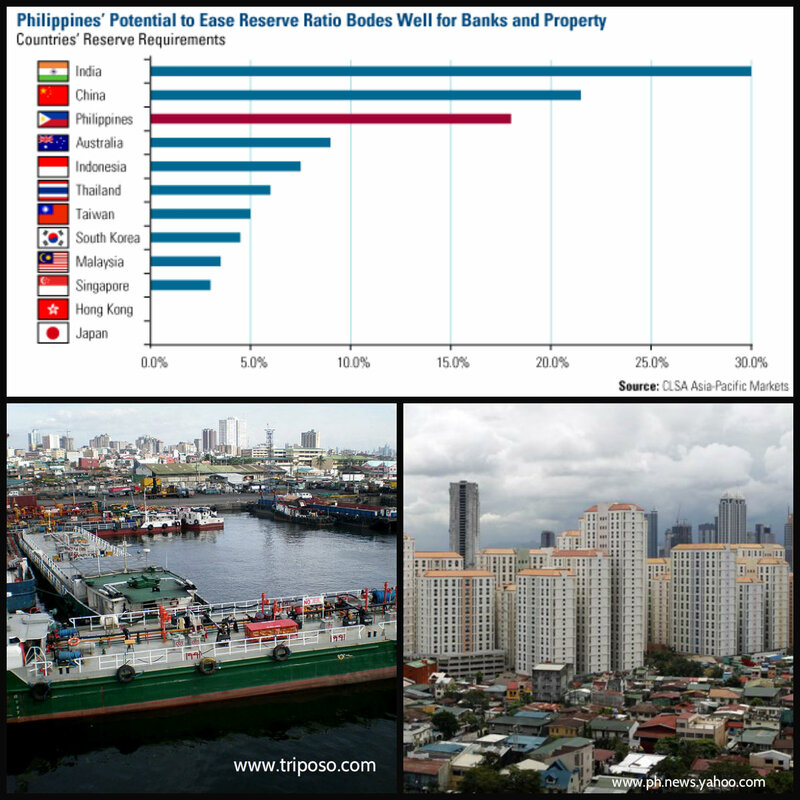 A bullish Philippine economy is good for the real estate sector. To value the education of the Filipino youths, the Department of Education was given a tentative budget at P1.049 trillion, making DepEd the highest ceiling in the budget for government agencies. The Department of Public Works and Highways (DPWH) follows at P189.295 billion. Then the next are Department of Interior and Local Government (DILG) at P92.215 billion and the Department of National Defense (DND) at P81.78 billion. Department of Social Welfare and Development, Department of Health, and Department of Agriculture were given P66.878 billion,P51.756 billion, and P48.33 billion respectively. IS DEPRIVATION of Child’s EDUCATION, Justified by CORPORATE GOVERNANCE?